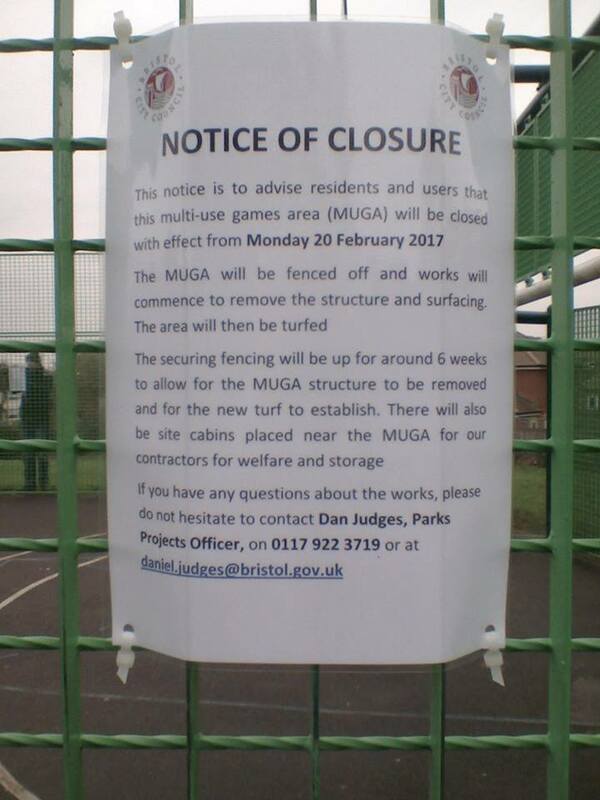 Following on from last month’s story about the closure of the MUGA on Manor Farm Estate we have to report that the MUGA was demolished and removed to a safe location on March 17th. The MUGA is to be turfed over as the Council has no legal obligation regarding noise from turfed areas. At a Neighbourhood Partnership meeting in mid-March an award of £1,000 was made for the area which will include the installation of a couple of five-a-side goalposts. There is still a feeling of anger across the Manor Farm Estate and a public meeting has been arranged for the evening of April 6th at The Beehive pub when the community can talk to Council officials. Horfield Councillors Claire Hiscott and Olly Mead will be in attendance, as will Councillor Asher Craig, Bristol City Council’s Cabinet Member for Neighbourhoods. As those resident in Manor Farm and in particular in the Maskelyne Avenue area will know the MUGA (multi use games area) has become somewhat a rallying point for the community once news of its impending demolition broke. As has been documented over a variety of media feelings have ranged from shock and surprise to outrage at the loss of a local facility for the youngsters due to a complex chain of events and circumstances some of which could have been foreseen and others not. The story is not over yet … as I write the community is waiting for a meeting with BCC officers to be called at which we can express our views on the future of the empty site and also of the re-siting within the bounds of Horfield/Manor Farm of the equipment. More news on this will follow via the pages of this publication and also the Manor Farm Community Hub Facebook page. What has been of particular interest is the effect this situation has had on the Hub Group and I have to say it is a surprisingly positive one! To date our very small but dedicated core group of around six active members from an e-mail list of around 20 and a Facebook group of a couple of hundred has been working extremely hard trying to build a dialogue with BCC more or less in isolation for well over two years as the fact we do not as yet have a physical building to call our own has made it very difficult and costly to hold events to being everyone together and get peoples’ views on how they see the future of Manor Farm. Now I feel all this is about to change … once we covered the MUGA story on our Facebook page and more and more people expressed views, posted pictures of the candlelit vigil and of the days when the television news came to interview residents people have now become more interested in Manor Farm as a whole and have proven that when an issue arises that touches their lives and their children’s lives it brings a whole new meaning to the word “community”. There has been more interaction from Facebook page members on the page than ever before (even dwarfing the previous number one topic for interaction which was Southmead hospital parking issues) and more comments about what people want for Manor Farm in general, our core group now has two more new active dynamic members bringing some much needed new blood. We will continue to do our best to deliver some of this … while we wait for definite news of the St Peter’s site housing development/community facility from BCC we can still have some fun at the planned FUNDAY on 8th July, watch this space for more information on how you can help fundraise (we are a wholly voluntary group with no regular source of income and our coffers are more or less empty) to make it a day to remember and/or to help out on or simply come and enjoy the day!